The tiny seeds, wrinkled and stripped off any trace of moisture, bled beautifully into the thick pool of oil. The color isn’t red. It’s orange. It’s deep, very deep, bloody orange. It’s quite remarkable how the seeds from a fruit that looks so otherworldly because of the stiff hairs that completely cover its skin can be used to color and flavor food. The brilliant achuete isn’t originally Filipino. 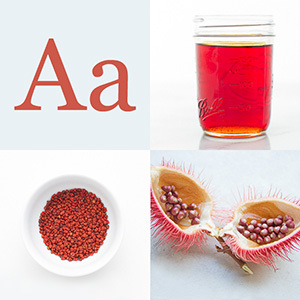 Annatto or achiote is from South America. Thanks to the Galleon Trade between Manila and Acapulco hundreds of years ago, the ships that bravely sailed across the Pacific introduced the natural food dye to the Filipino pantry and made it even more colorfully diverse. As soon as the achuete seeds and garlic cloves started to sizzle in the hot oil, I took the pan off the heat and let the color bleed for a while longer. As the deep orange hue and and peppery flavors steeped, I happily dreamed of sotanghon soup and kare-kare — a stew of oxtail and tripe with ground rice and peanuts, vibrantly colored with achuete. Besa and Dorotan’s versatile achuete oil works incredibly well in sautés, soups and stews as well as grills and roasts. Use achuete oil in place of vegetable oil whenever you need a warm burst of orange color. The oil, when refrigerated, will keep for up to two weeks. A is for achuete is the first in a series of posts about Filipino food words. So much is lost in translation, I know, but I hope this glossary will help those unfamiliar with Filipino food become more informed. Warm the oil and the remaining ingredients over medium heat. When it begins to bubble, turn off the heat and allow the mixture to steep for at least 1 hour or up to 2 hours. Strain the oil through a fine mesh strainer and let cool. Store in an airtight container and refrigerate. Yes, Victoria, You can used powdered achuete to make the oil. Just strain the oil with a very fine mesh strainer before cooking with it. I”d try a tablespoon for every quarter cup of oil and adjust the color by using more or less powder. 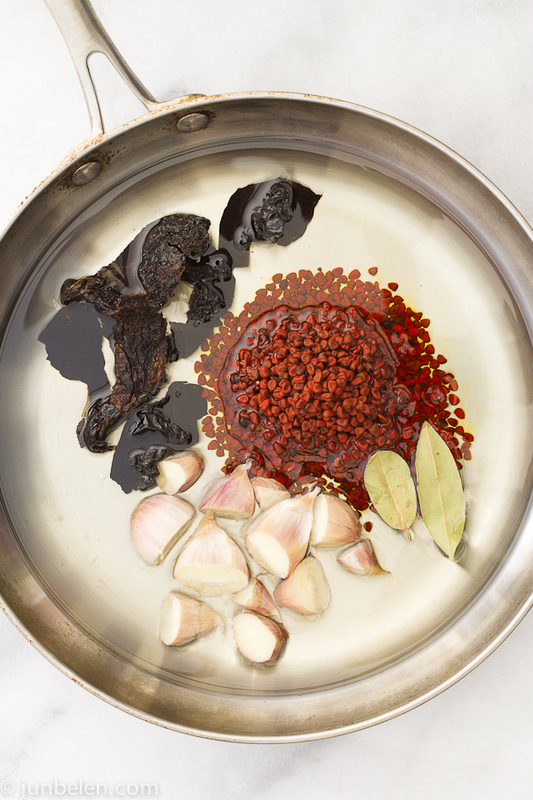 Lee, ancho chili is a dried poblano chili — a very mild chili pepper. Hindi kasing-anghang ng siling labuyo. You can make achuete oil without it. Just use achuete seeds in vegetable oil. pano po ung achuete water na gamit ung anatto powder? Yes, you can. I’d use a teaspoon of powdered ancho chili. You can also skip it altogether. there’s a shop on grand avenue in Oakland, CA… think it’s called “the spice shop” they have achuete seeds! Hi Jun! How long can you keep on a refrigerator this achuete oil? And can I make this without ancho chilies? Or does it alter the taste without it? I only have here powdered achuete, can’t find it in asian shops. Leonor, you can make achuete oil without the ancho chilies and you can use achuete powder instead of the seeds. Most of the time I skip all the other ingredients and let the achuete seeds steep in oil. It’s a quick version good for quick stir fries. The oil will keep in an air-tight container for about three months.